Ham can be substituted with any meat of choice. Combine all ingredients in a large bowl and mix well. Cover and refrigerate until ready to serve. 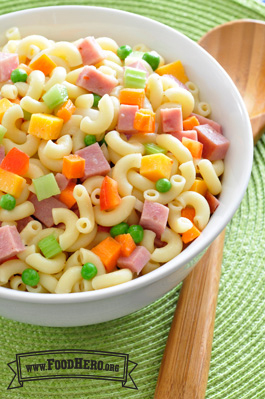 4 Comments for "Pasta Salad"
Kids love the color and the added protein of this salad. Great well rounded snack or meal! Such an easy and yummy dish!! Such and easy but tasty recipe! Very simple and colorful dish! Makes a quick healthy meal for young children.